Preston Byrne is an independent consultant and founder of Tomram LLC and the former chief operating officer of Monax Industries, an enterprise blockchain software vendor. Recent news stories make it pretty clear that the new people in bitcoin have no idea what they’ve gotten themselves into. Bitcoin is the Gom Jabbar of high finance. Cypherpunks who have populated the space to date hold the line because they do not care about money, and therefore do not fear. These new people are different. The only reason they are here is the money. When we consider that money from fresh, naive amateurs is flowing into the sector at a rate of millions of people per month, we should also understand that these amateurs are more susceptible to the animal spirits than their stoic, abrasive, less-socially-adept, battle-hardened forebears. They will be prone to cut and run. As such, a shock to the system, such as an exchange being taken down in a necessary and overdue enforcement action, could lead to a loss in confidence in the entire cryptocurrency ecosystem as a whole and a stampede for the exits the likes of which bitcoin has not seen to date. In a recent post on my own blog, I pointed out that bitcoin, by setting itself up as a sort of decentralized bank, was also creating an unreasonable expectation to its new “depositors” that they will always be able to redeem their assets at par, given a wild mismatch between its $200 billion “market cap” and new investor money – which is clearly well shy of that number. This expectation is dangerous as it means, in the event of a liquidity crunch, people will behave not as people necessarily behave when there’s a sharp sell-off in a stock, but more along the lines of when their bank’s solvency is being called into question. Remember bank runs? As bitcoin qua decentralized bank is running a fractional reserve with a chronic shortage of dollars, a shock therefore has the potential to not just drive the price of bitcoin down a little bit, but also lead to a major liquidity crunch and abject panic. I had a hunch people were lending into the sector. I just didn’t know the degree of alacrity with which this lending was taking place. “Dan Matuszewski, the head of trading at Circle Internet Financial, said during a morning panel that there is a ‘real strong need’ for the ability to borrow in this market. It would not only facilitate short positions but also provide working capital for trading desks to make markets, he said. During his talk, [Max] Boonen of B2C2 acknowledged the irony of the situation given that bitcoin was born as a reaction to the 2008 credit crisis. So someone’s lending directly into the market, we just don’t know who, nor how much, nor where the liquidity for these lines of credit is ultimately coming from. Leverage sneaks into the ecosystem in other ways, too; for example, Coinbase accepts credit cards, which is basically margin trading for grandmas, without collateral and with 20%+ rates of annual interest. Given that rather a lot of people seem to be interested in buying bitcoin in this way, and that platform is racking up a few hundred thousand new users a week, there’s undoubtedly systemic risk building up there. Long story short, these neophyte masters of the universe, too young (or too busy working as a dev in California) to know what a financial crisis feels like, and too dilettantish to find out, are successfully (a) getting buyers to leverage to buy coins, in some cases probably up to the hilt, or (b) convincing institutions to lend into this titanic, one-way, unhedged, $300 billion insanity trade, and trying to convince more of them to do so in greater amounts. There are two not necessarily mutually exclusive ways people are responding to the Great Bubble of 2017: anticipatory schadenfreude on the one hand, abject horror on the other. So far the response from mainstream finance has been the former, with The Wall Street Journal’s treatment of the subject being more or less a long-form joke. But while there is something ineffably twee about a retiree trying to show how they’re hip and “down with the kids” thanks to their position in “big coin,” the fact that they are doing so raises very serious questions about bubble-driven risk (and attendant negative externalities to society) which merits closer attention. As of right now, the notional value of the cryptocurrency sector is roughly a third the size of Long-Term Capital Management at its peak. Cryptocurrency is, admittedly, much smaller than the subprime bubble that popped a decade ago, which was roughly two orders of magnitude larger than bitcoin today. But bitcoin has shown, on several occasions, a persistent ability to defy detractors like me to grow an order of magnitude in less than 12 months; if it does so again, it will be three times larger than LTCM. LTCM on its own very nearly ruined the world in 1998. If we aren’t careful, this is the kind of market where a financial institution can get in serious trouble extremely quickly (imagine the damage a character like Nick Leeson or Kweku Adoboli could have done trading Bitcoin contracts – which are coming soon to both the CME and, reportedly, Nasdaq). We know that cryptocurrency marketing is writing checks the technology can’t cash; most of these systems are unusable as backbones for global finance. It is a matter of time before the punter on the street becomes as disillusioned as I, an irascible blockchain software entrepreneur, have become. It’s just that none of the newcomers know what they’re doing, and most of the old-timers who have figured this out are keeping their mouths shut out of self-interest. Put another way, this is a disaster waiting to happen. Fortunately for us, 2008 is not ancient history, and the fact that Bitcoin is a classic, manic bubble is so transparently obvious that it should be impossible for thinking people to deal with it otherwise. There are no excuses for not doing right by the societies and taxpayers who had to bail out the financial services industry last time around. So, banks, shadow banks, and anyone else of systemic importance, I implore you: for the good of everyone, by which I mean for the good of the human species, keep this garbage, and anything connected to it, the hell off of your balance sheets. For once, please have the good sense to not load up on frothy bubble-driven financial assets, which you have done hitherto with such predictable regularity that the European Central Bank can model it and write a 52-page paper on the subject which is actually fun to read. That way, when regulators finally bring this party to the bitter end it so richly deserves, the rest of the ship won’t go down with it. 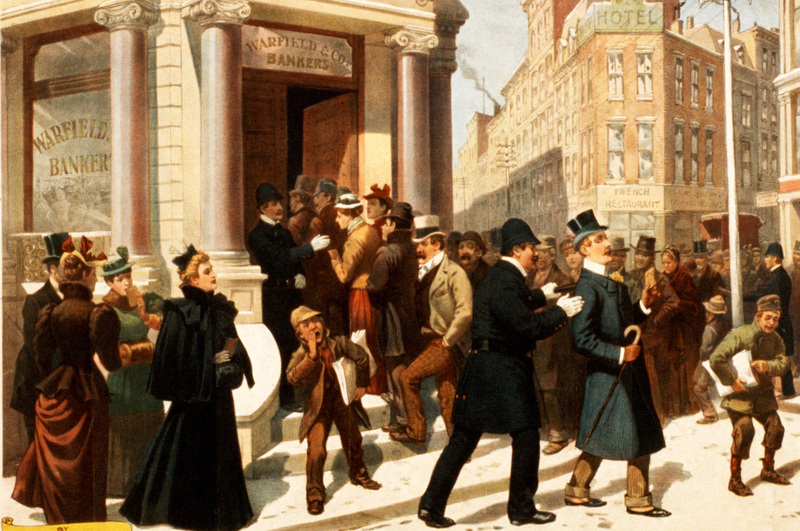 Bank run image via Wikimedia Commons.